Johanna Drucker is a writer, scholar, artist, and the Breslauer Professor of Bibliographical Studies at UCLA. She has lectured and published widely on topics related to the history of the book, digital aesthetics, graphic design, visual epistemology, and contemporary art. She’s the author of more than a dozen works of critical scholarship, including: Graphesis: Visual Forms of Knowledge Production (Harvard University Press, 2014); What Is? (Cuneiform Press, 2013); Digital Humanities, co-authored with Anne Burdick, Peter Lunenfeld, Todd Presner, and Jeffrey Schnapp (MIT Press, 2012); Graphic Design History: A Critical Guide, with Emily McVarish (Pearson/Prentice Hall, 2008); The Visible Word: Modern Art and Experimental Typography 1909-1923 (University of Chicago Press, 1996); Theorizing Modernism (Columbia University Press, 1996); The Alphabetic Labyrinth (Thames and Hudson, 1995); and The Century of Artists’ Books (Granary, 1995). Ten of her books of creative prose have been published, including: Italy (The Figures, 1980); Three Early Ficitions (Potes and Poets, 1994); Dark Decade (Detour Press, 1995); Diagrammatic Writing (Onomatopée, 2014); Fabulas Feminae with artist Susan Bee (Litmus Press, 2015). Downdrift: An Ecological Fiction is forthcoming from Three Rooms Press (2018). In addition, she produced almost three dozen editioned books under the imprint Druckwerks, including The History of the/my Wor(l)d (1990), The Word Made Flesh (1989), Narratology (1994), Testament of Women (2006), and Stochastic Poetics (2012) which are held collections throughout North American and Europe and were the subject of a retrospective, Druckworks: 40 years of books and projects, that began at Columbia College in Chicago in 2012. She is currently working on a database memoire, ALL the books I never wrote or wrote and never published. 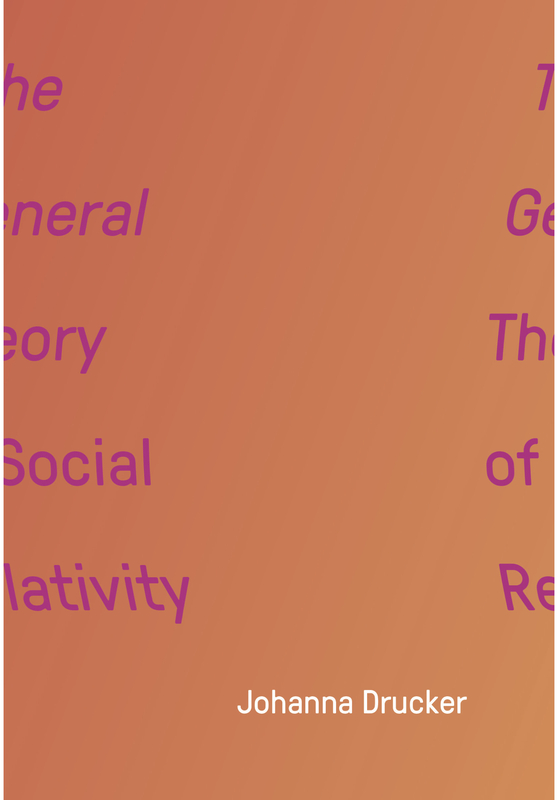 The General Theory of Social Relativity addresses the fundamental question of how we are to understand the forces at work in the social world, and presents a radically innovative framework for thinking about social processes. A century ago theories of quantum physics and general relativity exposed the limits of Newton’s classical, mechanical, approach to explaining the forces at work in the physical world. But the social sciences, including critical aesthetics rooted in 19th century political theory, remain caught in a mechanistic paradigm. Drucker's formulation offers a non-mechanistic approach to the understanding workings of the social world and the affective forces at work in non-linear politics and aesthetics. Right now, the impotence of explanation is intensified by the erosion of belief. Political events outstrip our rational imagination. We are witnessing the rise of a perverse nihilism and a grotesquely distorted appropriation of avant-gardism as political action. This is emphatically not political art¬. But these actions demonstrate how easily the tactics of disruption and distraction can be appropriated by the political world. At the same time, within the realm of art practices and activist politics, conceptions of resistance and transformation remain prevailing myths. The desire to believe in actual affect, in agency with direct impact, drives organized actions, marches, protests, letter writing campaigns, and other activities that try to use the machinery of democratic process to effective, even progressive, ends. This is essential; every means of engagement has to be kept alive in the current struggles against the massively powerful force of wanton destruction we are witnessing. But what good are direct actions in countering mass hallucination? Can marches and protests take apart the seductive appeal of made-up constructs? Can directed activity get any traction on the smoke-screen information of alternative facts, of consensual unreality, on the engineered construction of the never-even-simulacral, but wholly invented?